There’s something truly special about (vegan) Indian food. I love how all the aromatic spices blends beautifully together with different kinds of vegetables and legumes, for an explosion of flavour. 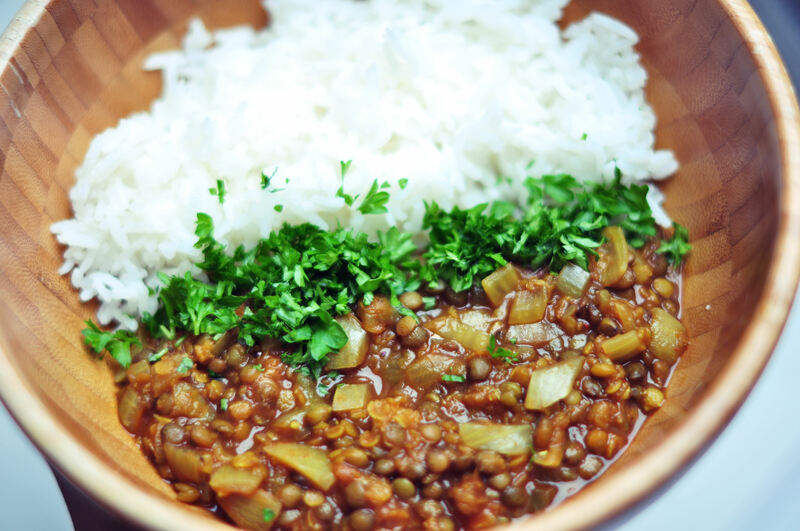 Dahl is something I’ve made many times in the past because it’s really easy, affordable and taste so incredibly delicious – especially when served with some fragrant jasmine or basmati rice with a sprinkle of chopped parsley or coriander (Some green peas on the side also serves this dish well). This dish is basically fat free, and provides a good dose of healthy plant-based protein. But trust me, you wont even know this is fat free, because the red lentils will break down and together with the tomato paste it will create a delicious and flavourful sauce! There’s quite a lot of spices going on in this dish, and if you don’t have all of them on hand that’s absolutely fine. BUT I really do encourage you to get your hands on the listed spices, because they really provide an amazing flavour, and I use them all the time. And please don’t judge this dish based on it’s appearance! Haha, I promise it tastes better than it looks. Start by dicing your onion into small chunks, and chop garlic and ginger finely. 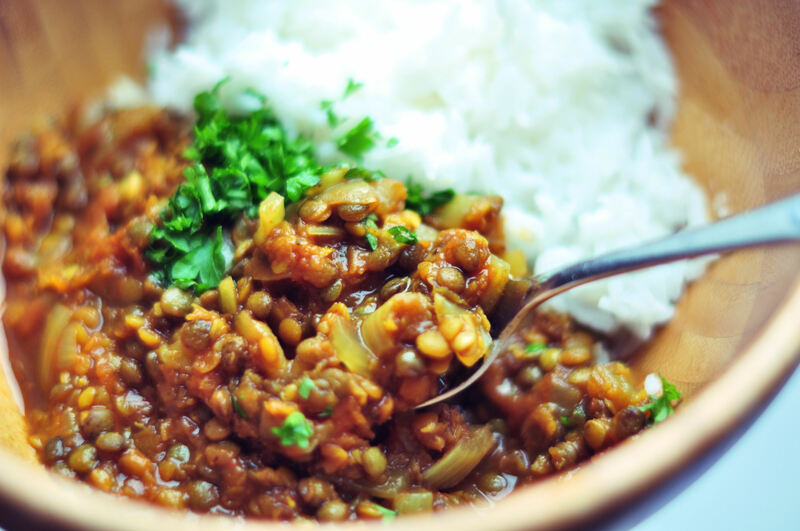 Measure out your lentils and put them in a strainer – rinse well. Sauté onion in a medium pot (in water or oil) for a few minutes. Add garlic, ginger and spices. Stir again for about a minute. Then add lentils, water and bay leaf. Cover the pot and bring to a boil. When it boils, turn heat down so the lentils are slightly simmering. Cook for about 30-40 minutes. 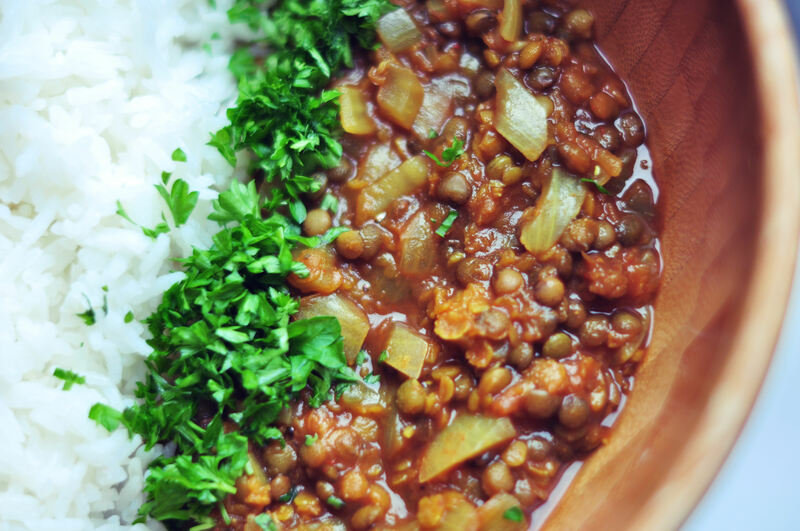 Check if your lentils are tender (they should be pretty soft and squishy). There should still be water left in the pot at this point. Add tomato paste and sea salt and stir well. 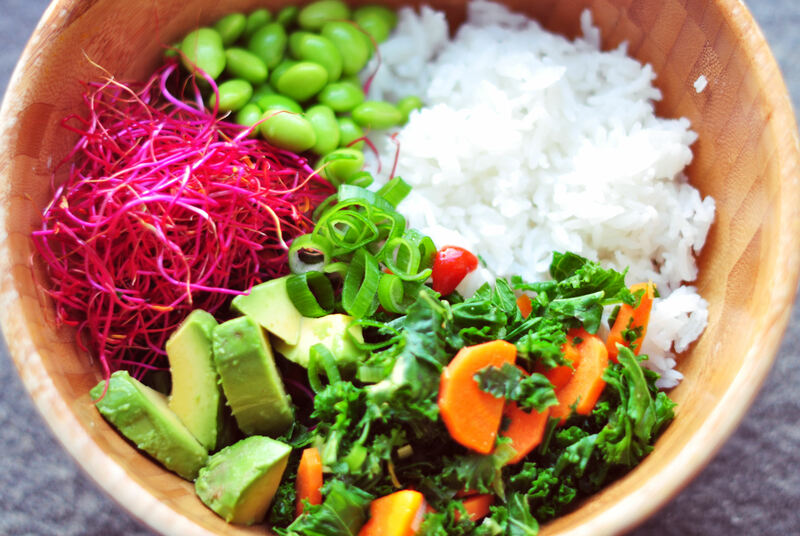 In this pic I used: jasmine rice, organic frozen edamame beans (that I peeled from their pods), lovely vibrant beet sprouts, creamy avocado cubes and a quick sauté of carrots, kale and green onion seasoned with sriracha. All in all a very filling, delicious and nutritious dinner! 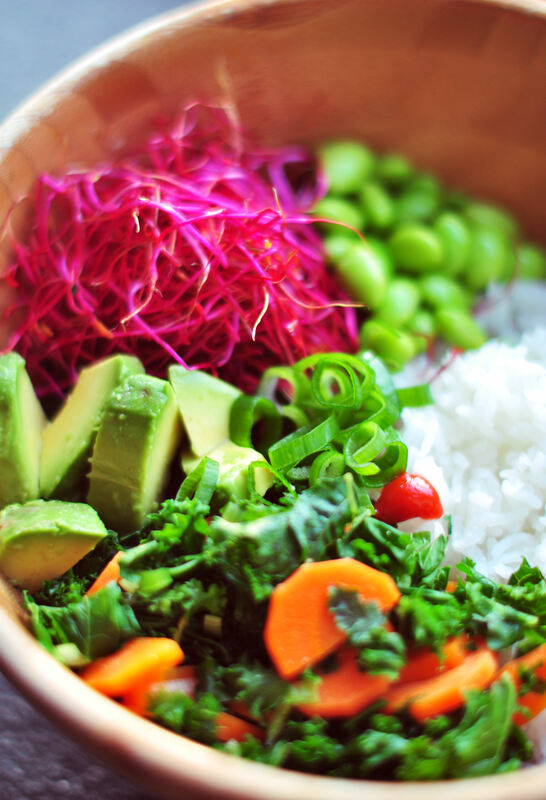 Now, the point of this is that you can mix and match anything you feel like, and make a delicious macro-bowl. For grains you could for example use quinoa or brown rice and then add your favourite greens, legumes and sprouts of choice. Arrange it nicely in a bowl and drizzle with lemon juice/sriracha and you got yourself a super healthy and easy dinner! Next > A perfect bowl of oats!